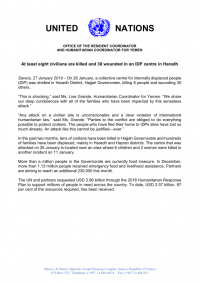 Sana’a, 27 January 2019 – On 26 January, a collective centre for internally displaced people (IDP) was shelled in Haradh District, Hajjah Governorate, killing 8 people and wounding 30 others. In the past two months, tens of civilians have been killed in Hajjah Governorate and hundreds of families have been displaced, mainly in Haradh and Hayran districts. The centre that was attacked on 26 January is located near an area where 6 children and 2 women were killed in another incident on 11 January. More than a million people in the Governorate are currently food insecure. In December, more than 1.13 million people received emergency food and livelihood assistance. Partners are aiming to reach an additional 230,000 this month. The UN and partners requested USD 2.96 billion through the 2018 Humanitarian Response Plan to support millions of people in need across the country. To date, USD 2.57 billion, 87 per cent of the resources required, has been received.